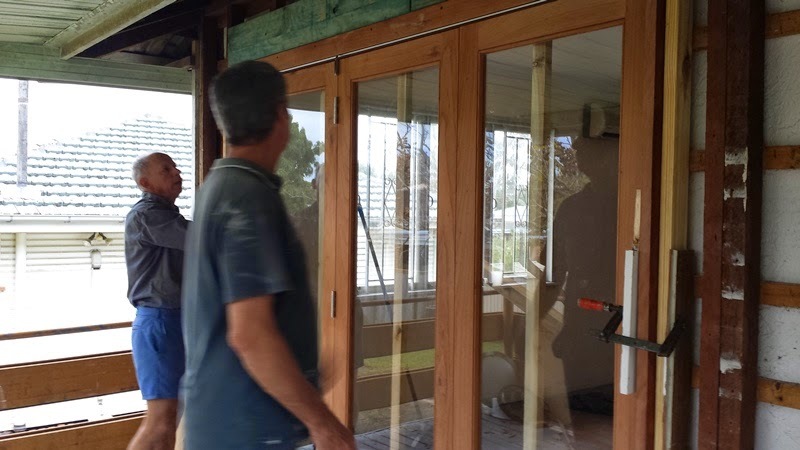 One of the bigger changes we have made to the living space has been to replace an existing window with a bifold cedar door that opens up onto the deck. At the same time, we also replaced the existing kitchen window (which was previously frameless glass sliding panels) with a cedar bifold servery window. You'll notice that at the moment it looks a little odd hanging from the side of the house as it does, we intend to extend the deck below the window and include a BBQ space. Actually, there's a lot we intend to do with the deck but that's all down the track. Installing the window and door each took about a day, then I have coated them with a 3 coat Sikkens system (HLSe in Light Oak and Supernatural in Pine) which took about a day per coat as they're quite fiddly to paint. We also widened the doorway between the kitchen and dining space which you can see in these photos. The kitchen window was relatively easy to have installed, the existing window was the same size so it just slotted it. The biggest challenge was holding it in place while it was attached to the house when there was no deck outside to stand on! The door was a little harder to have installed than the window, it required a new lintel above the space and obviously cutting a bigger hole in the wall. The results are just amazing though, I'm so happy with it and it's really made the house a lot more modern and full of light. I'm itching to start on the deck but it won't happen until well into next year.